The race for the final playoff spot from the Western Conference appears to be down to two teams. 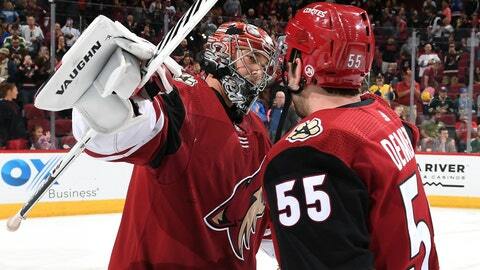 The Arizona Coyotes are one of them, and they can take over the second wild-card spot with a regulation or overtime win against the visiting Los Angeles Kings on Tuesday. The Coyotes enter Tuesday two points behind the Colorado Avalanche for the final playoff spot from the West. In order to move into a playoff spot, Arizona (38-33-8, 84 points) would also need Colorado (36-92-14, 86 points) to lose in regulation on Tuesday to the visiting Edmonton Oilers. The Coyotes and Avalanche each have three games remaining, and both have 34 regulation and overtime wins, which is the first tiebreaker used in the standings. The Coyotes haven’t been to the postseason since 2012, and they haven’t experienced a playoff race this far into a season since 2014. The Kings eliminated the Coyotes in the 2012 Western Conference Finals before winning their first Stanley Cup championship. They’ll try to put a dent in Arizona’s playoff hopes in 2019 after a lackluster effort on Monday night, losing 7-2 to the visiting Calgary Flames. Kings forward Anze Kopitar had three goals and two assists in the five-game series win against the Coyotes in 2012, and he owns 73 points in 70 regular-season games against Arizona in his career, the most against any team. Kopitar played in his 1,000th NHL game on Monday, assisting on the team-leading 22nd goal of the season by longtime linemate Dustin Brown late in the first period, tying the score at 2-2 before Los Angeles collapsed in the second and third periods. The Coyotes will likely continue to lean on goalie Darcy Kuemper. He has started 20 straight games, and seems to be getting stronger with each outing. Kuemper has shut out two of the past three opponents and hasn’t allowed an even-strength goal in that span. Despite not taking over as the No. 1 goalie until late November, Kuemper has established career-highs in games played (53), wins (26), and shutouts (five). Among the NHL goalies with at least 50 appearances this season, Kuemper ranks No. 1 with a 2.34 goals-against average and No. 2 with a .924 save percentage. Kuemper has faced the Kings twice this season and given up two goals each time. The Kings won 2-1 in Los Angeles on Dec. 27 to cap their season-long four-game winning streak. The Coyotes hosted the Kings on March 9 and came away with a 4-2 win.